We've been on our little farm for a week now and its so lovely - quiet; peaceful; beautiful - very glad we made the move! Having our sheep (4 ewes and a ram) delivered in a week and a half, also 2 aplacas for herd guardians. We've fenced in the old horse corral for our chooks and lone duck - they don't know themselves with all that luxurious space and long grees grass! Planning to put the sheep and alpacas in the adjoining paddock so hopefully the alpacas can also act as fox protection for the chooks. Have decided to buy a milking cow a year from now - not to rush into things too quick. Though we are thinking of buying some young cows and fattening them up to sell later on, seeing as the paddocks have so much lush grass at the moment and there is so much spare space! Just made it up home on friday in my mums little borrowed corolla (yes we still have the one car thanks to my very generous parents!) - massive storm hit, had basically no visibility and the road had just been graded that day with soft sand......then got to our driveway and couldnt stop - couldn't see the driveway so much water - had to just push the car up the hill with water fountaining either side - but we did just make it! Kids thought it was great - I was glad to have made it home! I'm sure you've mentioned it before, but I can't remember, where about did you move to (as in State?). So glad you're enjoying your new farm, how many acres is it? Pleased you in and settled, like Heidi my memory too has slipped, where did you move too and what did you get? Hayhay wrote: We've been on our little farm for a week now and its so lovely - quiet; peaceful; beautiful - very glad we made the move! Oh no just wrote a huge post and its lost in the ether!!!! Di I like the name - and yep Kathleen sometimes names just happen. The boys are super keen on 'working farm' and DH is keen on 'gosling farm' - cept we don';t have any geese yet! We're south of ballarat in Vic. 16 acres. Have taken lots of pics; will have to get round to downloading then uploading them! DH has been writing a blog but been so busy no time for any pics of the farm as yet - will post the link when he's gotten round to it. He and a friend moved the bees up on tuesday - apparently they are very angry about being moved, so i'm steering well clear! opportunity with a work friend of my husbands who is a chef - he's wanting to put a coolroom on his property to butcher and process his and our meat - which we'd probably keep the livestock here as its a bit bigger than his place. Love the mutual working together! And love the help we've had from family and friends - my dad spent 8 out of 9 days straight working here; and he's been back since; and planning to come back this weekend to do fencing. Makes it all so special to have those links of help and support setting up. Congratulations, wonderful that you've got there so quickly!! Kids thought it was great - I was glad to have made it home! kids are so funny sometimes when we go through a tricky situation that they just don't see danger... I remember years back just getting cattle high above flood water breaking over the paddock, and my much younger brother and sister thought it was great to turn around and see the paddock underwater, and said 'gee we could go watersking' I was just relieved us and the cattle made it to high ground. All exciting stuff ahead, enjoy. PS Our property 'The Cat's Ears' based on the shape of the creek bounding us. Thats a great name - funny how they come to be sometimes I love you property name to Vicki - its so unique! Hope those bees settle in soon and start making yummy honey! Do you have a property name Desley?? Another great name Vicki - sounds so connected to the property. Hmmm, I went to see the beehives tonight; not planning to go anywhere near, just see where they were and how they were doing. I stopped a good 50 metres or more away; then realised I had a number of them circling angrily around me! So very carefully carried the new pup and walked very VERY slowly back out out of the paddock. They kept circling me all the way to the gate too! So yep, hope they settle down and become nice happy bees again soon! The farm had a name when we moved in - a sign out the front proclaimed 'willow glen'. Which was quite ridiculous really as there is no glen and not a single willow in sight! So the sign has been pulled down. The boys were actually quite worried about that - they though we'd be legally bound or something to keep the name and were getting terribly disappointed in not being able to call it 'working farm'! Our place is called "Jenga" after the game where you pull out blocks from a tower, and the aim is to be the person who doesn't make it collapse! Well, when we bought our farm, we did that many renovations internally, and pulled out that many walls, that for the longest time,the main roof beam was held up with an acroprop. I named it Jenga, because I thought at any moment the whole roof was going to come crashing down! It sounds like our place at Hogarth Range, I do hope I don't have to wait that long before we can do some things to the house here, but... you know how it goes with renovation. I wouldn't say our property has a name as such but we just use the name of our stud mostly - "Calliandra" - its my favourite flowing shrub. I plan to eventually have them planted all over the place. They are so beautiful and also make good animal fodder. Hayhay wrote: Another great name Vicki - sounds so connected to the property. Hmmm, I went to see the beehives tonight; not planning to go anywhere near, just see where they were and how they were doing. ! Well we've been here 3 years now - and the name has only just found us. It was called "Spirit Creek" by the previous owners - because some poor sole had committed suicide a few km from here some 60 years ago. We found it incredible that anyone could be that macabre & insensitive as to name a farm that way, so that Sign was the first thing to go. The view of the mountain that looked like a lion 'of sorts' from here. And our land is a clearing surrounded by forest. The clearing bit was easy - 'Glade'. And originally We had "Lion Rock" in out minds, but 'lion' somehow was just too African and it just didn't fit, or flow nicely. Mount Lindsay doesn't look anything like a lion anymore - to us it's definitely a beautiful Thylacoleo! Aw Glyn those claws are huge compared to the other ones... a bit like many of our marsupials. Now how do you pronounce it? Our previous property was named by a long time previous owner 'Seco' hence I had the domain name... he was from the US (southern state that escapes me) and he said the place was 'so seco' which is dry in spanish. I just love the names people call their places and why. I always wondered where Seco came from! Great hearing about people's property names and how they came to be. Had some friends stay last night and all working this morning preparing for 3 yr olds birthday party; it really struck me that 'working farm' was probably quite appropriate! 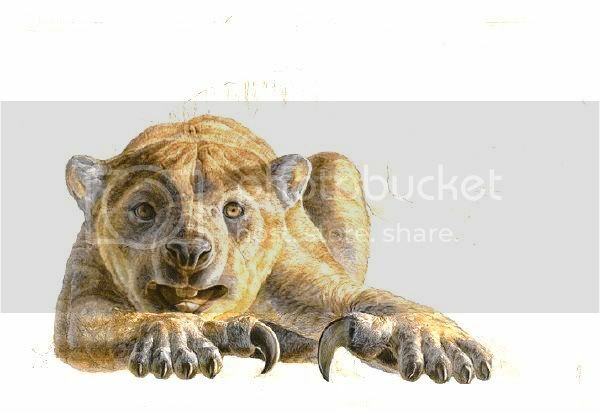 We thought it was going to be like in Thylacine with a soft c Thy-lace-o-leo but apparently its Thy- lack-o-leo. Yes Seco for the forum was a bit of a rush and there are other names associated with it but people remember the seco so... I did try to make it mean something but at the end of the day it means 'dry' so maybe it's the dry humour at times.